Olympics: Where does Indian hockey go from here? India's chief hockey coach Michael Nobbs has said he was deeply hurt with the performance of the eight-time Olympic champions in the 2012 London Games and was apprehensive about the future of the team. The Australian was surprised with the sudden lack of form of the players, who did so well only three weeks back during their European tour. The Indian team is on a losing streak having lost four group matches. "Where do we go from here? I am, of course, completely disappointed. We showed so much promise as we played during the past 12 months. Preparations and team building were going according to schedule and our results had showed we were improving. I don't know what is going wrong," he said. Nobbs said the lack of finishing and poor defence has proved costly for India. "The same things that we all knew... lack of finishing in front of goals and leaking easy defensive goals... have proved to be costly. Maybe we were hoping it would all be alright on the day. Well this is the Olympic Games and this is where as an athlete you get the chance to show that you deserve to be here and establish yourself as an Olympian. "Well we can all see that it is not all right and the things we have been concerned with have been our downfall. Our forwards have had ample opportunity to score with 30-40 penetrations into the opposition circle per game. Many shots went abegging in front of goals and our once feared penalty corner battery reduced to a mere whimper with shots barely making the goal line," he said. Nobbs said Indians have to salvage pride in their last group game against Belgium and in the classification matches. "We still have two games to play to try and salvage something, this is the last chance for a number of players to stand up and be counted and produce the performances we all hoped they would," he said. Nobbs said players should not lose faith in their abilities. "It is important for our players not to lose faith in themselves and as a team as this is a tough time for the team but its certainly not the end of the road. "The next game will be against Belgium and they are no walkovers and are in a similar position as ourselves. They are a physically tough side with some skillful players and from watching their games they play with the pride of a nation so they will be a tough team to crack. Can we finally stand up and be counted? Well, we better, our performance to date is not acceptable," he said. 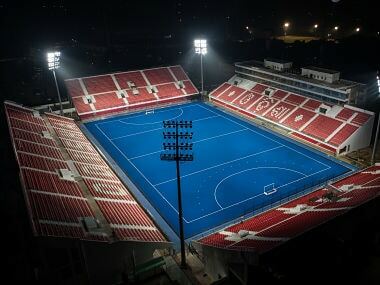 1Olympics: Where does Indian hockey go from here?